Western Australia: a place to live rather than visit? I’m now in Hobart, having moved from Australia’s largest state to its smallest. We only spent a six days in WA, and purely as a tourist. We didn’t visit anybody living here. So my view is inevitably superficial – but I hope it will still be of interest. WA is vast, taking up one third of the Australian continent. It is mostly empty of people. 80% of its population, we were told, lives in the Perth area. Most of the rest live in the south western corner, which includes Margaret River. We didn’t get beyond these populated areas. Central Perth is underwhelming. It has an undistinguished skyline of the usual tower blocks. Its setting, on the Swan River has potential, but the urban planners have given almost all the riverside to roads and speeding motor traffic. Only a small harbour area is free of traffic, and that is now mainly a building site. There is a pedestrianised shopping precinct but it is nothing special. There is a lovely park, King’s Park, just off centre (the largest central urban park in the world they claim), but even this is rather spoilt by trying to make it accessible to people in cars. The best views over the city are next to a busy road. There is quite decent public transport but car is king. Outside the centre there is the usual Aussie suburban sprawl, including some lovely waterside properties, once the roads have moved inland. These are surprisingly dense; all houses are detached, and they are mainly single story, but the backyards are tiny. The houses are cheek by jowl. Once you have acquired your building plot, the thing to do apparently is to cover it almost entirely with one storey of house. This holds throughout the residential districts of WA we saw. This may be a countrywide trend, but here even the posh homes on the river side looked a bit squashed up against their neighbours. The best bit of the Perth area is the old port of Fremantle. A lot of old buildings have survived and they aren’t dominated by newer ones. You can have a fish lunch on the fishing harbour watching dolphins near the fishing boats (real, working ones) without traffic whirring by. The port itself isn’t all that big. There were just three ships there when we visited, two stock carriers and a single container ship. Barcelona it isn’t. WA’s vast mineral exports don’t go close to populated areas. Outside Perth the main attraction is the continent’s southwest corner, around Margaret River. This is lovely. An attractive coast, with boutique farming inland, featuring its now famous vineyards. It’s a popular holiday district and deservedly so. We perhaps saw it at an ideal time of year, in between the wet winter and hot, dry summer. It was verdant, and the temperature in the very pleasant mid-twenties. There are plenty of wilderness sights in WA, but we didn’t have time to sample them. We will next time. And there could be a next time. We flew here because of the new Qantas non-stop flight from Heathrow by 787 Dreamliner. This was a success, and we prefer it as a way in to breaking the journey to the east cost to Dubai or Bangkok. But if they manage to put on a nonstop flight to Sydney, that might be a tempting alternative. 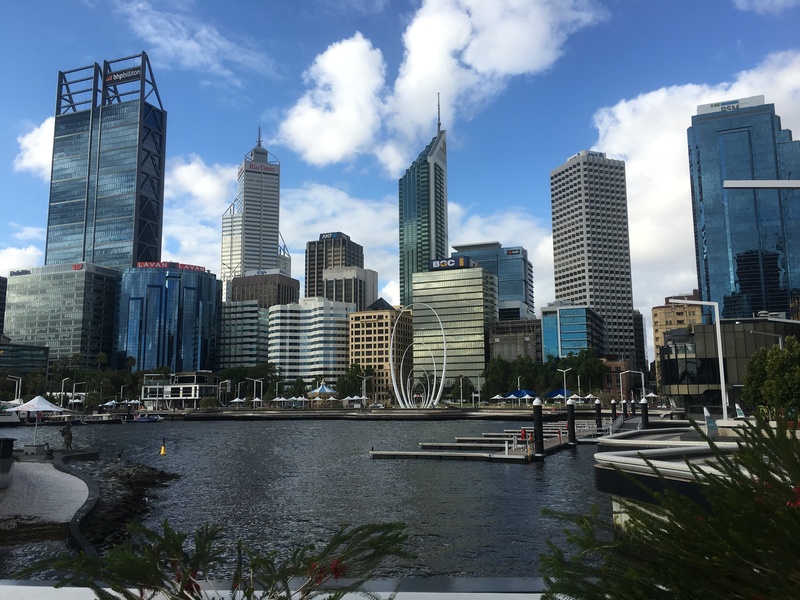 This is a mainly economics blog, so what could I make of the WA economy? It seems to be healthy and growing, though homeless people were to be seen frequently in central Perth. This appears to be mainly about mining, of which iron ore is the most important, but which covers a multitude of other things. This happens in the wilderness and is quite astonishingly destructive of the local environment. But as almost nobody lives there, that doesn’t seem to be an issue. The presence of aboriginal inhabitants is light. In the south west we only found any serious reference to them in the art gallery. Doubtless in the outback their presence is stronger, but the mining businesses clearly don’t have too much trouble. The mines do need quite a few people, even if they aren’t sent down holes in the ground when you can simply remove all the rock that is in the way. These are flown in for periods of one to three weeks from Perth and outlying towns. As these workers spend money in their home towns, and go on holidays, this drives much of the rest of the economy, or so we were told. The Economist suggests that automation is far advanced in the mines, and fewer workers are needed. There was no sign of that – perhaps because this affects workers shipped in from outside WA to a greater extent. There are a lot very wealthy people on the back of the mining boom – who in turn invest in the boutique wineries in Margaret River, as well as fabulous properties to live in. But there seem to be plenty of decent mid-level jobs too, which are the key to a broadly prosperous economy. One thing we noticed was that there were quite a few older workers – including just about all the tour guides we used. So my rather superficial verdict is that Perth and Margaret River are very pleasant places to live, with all the civilised comforts. If there are world-class tourist attractions they are probably in the outback, though apparently the surfing is world class too. But if you are visiting Australia anyway, it’s a nice place to go, though still over three hours flying time from most other places. Posted on November 12, 2018 Author MatthewCategories TravelTags Australia4 Comments on Western Australia: a place to live rather than visit? Two-party politics used to be the norm for developed democracies. Most countries’ politics were divided between tribal blocks based on the urban working class and on the aspirant middle classes. But the dominance of these two blocks has faded in most countries. There are two interesting exceptions: the USA and Australia. Here in Britain two-party politics looked as if it would triumph with the demise of the Liberal Democrat,s and the No vote in the referendum on the Alternative Vote (AV) in 2011. But now the system is its death throes. It is worth considering the architecture of two party politics for a moment. Electoral politics is dominated by two political parties, each of which may govern on its own, without the need for support from smaller parties in coalitions or pacts. Each of these parties has a tribal character, defining themselves as much in opposition to the other as by their own core values. But there is an undeniable class base two. This divides the country into heartlands, where one or other of the parties dominates to the exclusion of all others, and marginal territory, contested by both parties, where elections are won and loss. Many, if not most, politicians build their own careers in the heartlands, where advancement depends on internal party politics, rather than winning over marginal voters. This leads to the system’s major flaw – the political classes are more worried about their own backyard and internal politics than in appealing to the electorate at large. Or they worry about marginal voters to the exclusion of the heartlands. Distance between voters and politicians grows. The breakdown of this system follows the weakening of class loyalties from the 1960s onwards. New parties have emerged, from the liberal centre, from populist anti-political movements, from environmentalists, and from parties based on regional identity. In much of Europe coalitions became commonplace. Electoral systems played an important role. Those with proportional representation (PR) were the first to find that one party could not govern on its own. But in countries with single member constituencies one party could still aspire to win on its own. France’s two-round system promoted pacts and alliances between parties, and the major blocks split into separate parties – before the whole system started to be challenged by the populist Front National. Countries with First Past the Post (FPTP) systems have placed a greater role on party solidarity. But in New Zealand disillusion with two-party politics led to the introduction of PR; in Canada each of the two party blocks suffered existential crises that allowed more modern alternatives to replace them, at least in part. Australia’s AV system seems to have entrenched the two party system there, however. I will come back to that. In the biggest and oldest developed-world democracy of them all, however, the two party system remains completely dominant. In the USA there is no alternative to the Republicans or Democrats, although the occasional challenge comes and goes – even as more and more voters self-describe as Independent. But the US system of democracy is unique. Apart from the widespread use of FPTP (some states use a two round system – which is why the Louisiana Senate race is not yet over after this month’s nationwide election), I think there are three, inter-related factors: primary elections, decentralised power, and direct executive elections. Each party’s candidates are selected using primary elections which include much more than official party members. Such elections are part of the formal, state electoral process. Voters may register as Democrat or Republican. This allows them to take part in publicly-run primaries; in some states primaries are open – any voter can take part. That makes heartland elections competitive – and not a matter of manipulating small groups of insiders to secure your party’s nomination. It helps that each party’s national leadership is weak – so wheeler-dealing in Washington will not help a political career by much. This is a function of a system where much of the power is wielded at state level. One of the factors that keeps party functionaries weak is the prominence of direct executive elections, notably for President and state governors. In these cases personality often matters more than tribal allegiance. It is an interesting paradox – for the two party system to be robust, the party leaderships must not be too strong. This allows the primary system to flourish, and gives outsiders a chance to break into politics. But party solidarity is important enough for those in power to rig the system to provide incumbent politicians with electorally safe seats through the gerrymandering of boundaries. A diminishing proportion of seats in the House of Representatives are competitive between the two blocks. A large proportion of the important politics is now in the tribal heartlands, and not in marginal territory. As a result of this, it would not be right to describe the state of politics in the USA as healthy. There is increasing polarisation, which is causing deadlock and the prospect of extremist policies. Most Americans seem fed up with the state of politics in their country, though not necessarily with the system itself. Another case study in the survival of two-party politics is Australia. Politics is divided between two long-standing political blocks: Labor and the Liberal party, though the latter is a coalition of state parties (some of which refer to themselves as National or Country). There have been challenges to this duopoly over the years, but these have not made headway. No doubt there a number of factors that have contributed to this – but I think one factor is critical. And this is the AV electoral system. The legislature comprises single-member constituencies, and there is a single election day. Voters are asked to rank candidates in order of preference. If one candidate does not achieve more than 50% of the votes casts, the lower ranking candidates are eliminated and their votes redistributed. This is a bit like the French two round run-off system, except that with a single election day there is little scope for political deal making over second preferences. It is so important for candidates to maximise first preferences that it best not to talk too much about second preferences. This makes it very hard for challengers to win seats. First their first preferences have to overhaul one or other of the two main parties. But to do so they cannot say “vote for me to keep the other guy out”, because that is an argument for second preference votes, not first. Second preference votes are useless without sufficient first preferences. And then, of course, you must have sufficient first and second preference votes to get a majority. In marginal seats challengers will be beaten by the lack of first preferences; in heartland seats there will be lack of second preference votes. As a result almost all seats go to one or other of the blocks. In 2013 in order to turn out a lacklustre Labor government, voters opted for a Liberal one that is now pushing forward a series of extremist policies on the environment and immigration. So what of Britain? For a long time the main challenge to the two party system came from the Liberal Democrats, based in the liberal centre. It was skilful in winning seats under FPTP by establishing a local base, and then winning tactical votes from the weaker of the two blocks. This allowed it to win a substantial block of parliamentary seats in 1997, but not the balance of power until 2010. It then entered coalition with the Conservatives. And then disaster struck – the transition from a protest party to one of government was too much for the voters, and its poll ratings collapsed. Labour and Tory politicians breathed a sigh of relief – normal two-party politics could be resumed. Ironically, in view of the Australian experience, the Lib Dems placed some hope by proposing to change Britain’s FPTP system to AV. This would have helped the party in the short term, where it had built up a sufficient local base to win second place in first preference votes. Both major parties agreed with the Lib Dem analysis, and for that reason opposed the change (Labour through faint praise rather than explicit opposition). In a referendum on the change in 2011 an overwhelming majority opposed AV. This seemed to secure the future of two-party politics. But unlike the US, Britain’s politics is highly centralised. Party managers in Westminster like to keep a tight grip on their parties. And, again unlike the US, executives are elected indirectly, and candidates must master the internal politics of their own party in order to progress to high office. The idea of primary elections has not been allowed to gain traction. The Tories have moved small steps towards it, but without being able to harness state resources. The public has no way to channel its disillusion with politics than to vote for insurgent parties – since they are denied a role in the main party elections. And this they have been doing by supporting the populist Ukip in England and the SNP in Scotland. Unlike the Lib Dem challenge, these insurgencies have affected the main parties’ heartland voters. They are creating unbearable pressures with both party blocks. The Conservative and Labour leaders try both to fend off the insurgent challenge, and to retain the political centre – and as a result both appear weak, driven by events rather than leading them. This is creating unbearable strains and it seems likely both will fracture, especially if they have to endure the pressures of being in government. Labour face calamity in Scotland, as the SNP overturn their heartlands. In England Labour are a fragile coalition of public sector unions, liberal centrists and heartland machine politicians; each’s expectations of the party seems completely incompatible. The Tories look likely to fracture over Europe. Ironically, if both parties had embraced AV, they would have been in a stronger position to fend off the insurgents and maintain party solidarity. And yet this is just another face of a bigger problem that both party’s face. their obsession with winning the next election has meant a loss of strategic focus. The demise of the two party system looks alarming, as fringe parties gain prominence. But in the long term it is to be welcomed. As the USA and Australia shows, a two-party system is too easily captured by political extremes.